Thank you to PBS Masterpiece for copies of Victoria and Poldark for review. This post contains affiliate links. Do you have a period drama fan on your holiday gift list? I have a great list of the latest PBS Masterpiece dramas that will make your holiday gift giving as easy as a few clicks. Queen Victoria is one of the most powerful women the world has ever known. Jenna Coleman (Doctor Who) stars as the young queen at the outset of her epic reign, which set the stage for an entire era that would be named in her honor. Based on Louisa May Alcott’s beloved novel, and set against the background of a country divided, “Little Women” follows the four March sisters on their journey from childhood to adulthood while their father is away at war. Under the guidance of their mother, the girls navigate what it means to be a young woman. Starring Emily Watson, Michael Gambon, Angela Lansbury and Maya Hawke. In “The Durrells in Corfu,” Keeley Hawes (Upstairs Downstairs, Wives and Daughters) stars as an intrepid widow who decamps from dreary 1930s England to a sun-dappled Greek island with her four recalcitrant children, ages 11 to 21, in this adaptation of Gerald Durrell’s My Family and Other Animals and its two sequels. 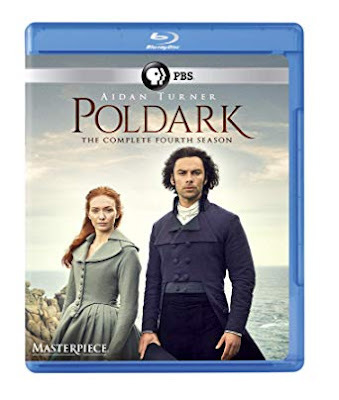 With the country gripped by political uncertainty and fresh elections, Ross Poldark (Aidan Turner) seeks to challenge George Warleggan's stranglehold over Cornwall while also repairing his marriage with Demelza (Eleanor Tomlinson). Hugh Armitage remains in love with Demelza and is hopeful for more. Dr. Dwight Enys and Caroline plan to start a family while Elizabeth seeks another child to secure her own marriage to an ever-suspicious George. Meanwhile, Morwenna desperately tries to protect herself from Osborne's advances by threatening their son, and a heartbroken Drake is encouraged by his brother Sam to find new love. Any of these PBS Masterpiece dramas would make a wonderful gift or stocking stuffer!